People seem rather divided over the look of Apple’s new iOS 7. But love it or hate it, iOS 7 is here to stay. That’s great for iPhone and iPad users excited for the new OS, but what about people using Android smartphones? 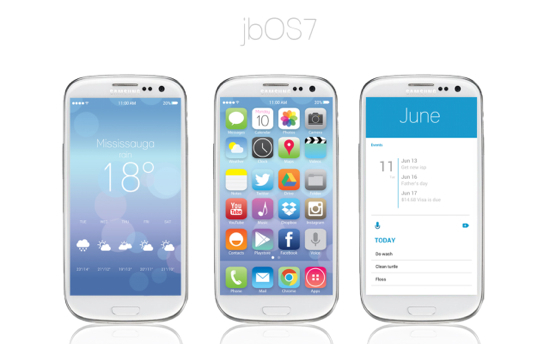 Fortunately, Android users who do want the iOS 7 experience are in luck because an intrepid Android developer has decided to copy it and create a theme for Android called “jbOS 7.” The theme, who’s full name is “Jelly Bean OS 7,” is compatible with handsets running Android 4.0 and later. Once installed, the theme mimics the look and feel of many aspects of the iOS 7 interface including the lock screen, home screens, some apps and the new app icons. The photo above gives you an idea of how that looks. There’s also a handy video as well, which we’ve included after the break. For more on “jbOS 7” or to get the files needed to install the theme, head on over to the developer’s website. In truth, we’re not entirely sure why someone using Android would want to do this, but heck, who are we to judge? People do love to modify their Android devices. Maybe the iOS 7 theme will actually catch on? If you’re tired of using that old version of Windows like XP or Windows 7, you’re in luck because Microsoft announced on Monday that its next-generation Windows 8 operating system will launch this October. The company confirmed during an event on Monday that the new OS is on track to be released to developers in August with a final release to eager consumers in October. In addition, Microsoft will also release new devices, including the Surface, to coincide with the OS’ release. The company also promised that users who purchase Windows 7 PCs before the release of the new OS will be able to upgrade to Windows 8 Pro following its release for just $14.99. Darn nice of them, don’t you think? Even though people still cling to using older versions of Windows like XP and even, in some cases, Windows 2000 or are just getting used to the idea of Windows 7, Microsoft is moving forward with the next version of its desktop OS known as Windows 8. To help get you used to the idea of a new version of Windows, the company has this week unveiled Windows 8 Release Preview. This version of Windows 8 is a “near-final” version for users to download and try before the OS is sent to Microsoft’s manufacturing partners. The Preview includes Internet Explorer 10, support for Adobe Flash and new Windows 8 apps for connecting to Hotmail, SkyDrive and Messenger. Nice to hear Microsoft is responding to user requests and addressing their issues. The real question, though, is if those responses and the rest of the work that went into Windows 8 actually pay off in a usable and stable new OS. I guess we’ll find out soon enough as the OS is officially released in October. Windows 8 Consumer Preview is a prerelease version of Windows 8 that focuses on people and apps and gives you powerful new ways to use social technologies to connect with the people who are important to you. Windows 8 Consumer Preview is built on the rock-solid foundation of Windows 7 and has the security and reliability features you expect from Windows, but we’ve made it even better. It’s fast, and it’s made to work on a variety of form factors—especially the new generation of touch devices. Well, there you go. You can go to Microsoft’s website and download Windows 8 to try for yourself. Although, unless you have a touch monitor you won’t be able to experience it exactly as it was intended. Even though we are mostly Mac and Apple users here at The Flickcast, that doesn’t mean we don’t know or care that another, more popular, company exists that provides software to run computers and the like. That company is, of course, Microsoft. With Windows 7 being our favorite version of the OS so far, Microsoft is going to have to go a long way to convince us that they have something better up their collective virtual sleeve. That something is, at least according to them, Windows 8. We will all get a chance to see if they are right come February 29 when the company releases what they are calling a ‘Consumer Preview’ of the new version of Windows. The company will reportedly announce such a preview at a special, invitation-only event in Barcelona. It’s interesting that they aren’t referring to this release as a “Bata.” I guess that has too much of a stigma of unfinished software or something that still needs a lot of work. The truth is Windows 8 probably still does need a lot of work and a big service pack will follow its final release as it does for most Windows versions. Not that Apple and most other software companies are immune to updates, they aren’t of course. Still, we do like the looks of Windows on the smartphone so if Windows 8 is anything like that, it might be worth checking out later this month. What do you guys think? Are you going to take the plunge and try out the Windows 8 preview? Even with all the hype and attention Apple gets for its product launches (yes, we love the iPhone 4S and iOS 5), we can’t forget the other smartphones out there. In fact, one of the most popular “other” operating systems, besides Apple’s iOS, powering some of the most innovative smartphones is, of course, Google’s Android platform. Now Google has taken the wraps of of its brand new version of Android, known as Android 4.0 or “Ice Cream Sandwich” during a press event in Hong Kong yesterday. The software was revealed next to the upcoming Samsung Galaxy Nexus, a smartphone we’re looking forward to checking out. Android 4.0 combines many of the tablet features already available in Android 3.x (Honeycomb) with the smartphone features available in Android 2.3 (Gingerbread). It will power both tablets and smartphones, and it offers several enhancements. Some of these include the ability to unlock an Ice Cream Sandwich device using face recognition. Android 4.0 also has a new cleaner “Roboto” typeface and an extensive UI makeover. The lock screen in Android 4.0 can be used to quickly unlock the phone or launch the camera, and users can also access notifications directly. “Back,” “Home” and “Menu” are now part of the Android virtual user interface and hardware buttons are no longer needed. We could go on about the new OS but instead, we’ve gonna let Google’s own video tell the story. Click through for it after the break.